Born in Sumpter South Carolina, Gilbert began his musical expedition in San Antonio Texas during his early teenage years. At 14 he began producing his own music as well as djing at local clubs & venues. 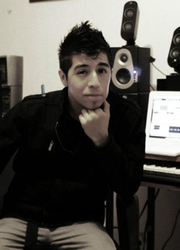 After several years of experimental producing & obtaining different influences & inspiration, Gilbert began to perform live Trance music at age 17. Over the years, he's mastered the elements of building & performing a live set with keyboards, midi controllers & laptops. As assumed, he is no longer a Dj, but a Live Performer Gilbert has releases on record labels that have support from super stars like Armin Van Buuren, Sean Tyas, & Paul Van Dyk. Gilbert began performing in the anime/pop culture scene in 2011. Since then he has grown into his own name in that scene. He's performed at some of the biggest conventions in Texas such as Realms Con in Corpus Christi (2015-2016), Project A-KON 27 in Dallas Texas (2016) and Dragon Con (2016). His performance with keyboards and laptops has sky rocketed his success and you can definitely expect Gilbert to be performing for larger conventions in the future.